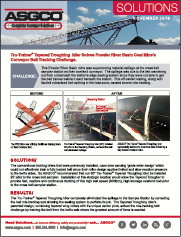 Tru-Trainer® Tapered Troughing Idler Solves Powder River Basin Coal Mine’s Conveyor Belt Tracking Challenge. Challenge: This Powder River Basin mine was experiencing material spillage at the cross belt sampler station on their overland conveyor. The spillage was due to the belt wandering out from underneath the station’s edge sealing system since they were not able to get the belt trained before it went beneath the station. This off-center loading, along with faulted vulcanized belt splicing in the load-zone, caused severe mis-tracking. 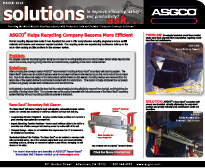 ASGCO® TORO™ Secondary Belt Cleaner Installed at This Recycling Facility Solves Major Carry-back Issues. 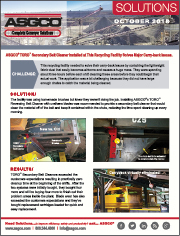 Challenge: This recycling facility needed to solve their carry-back issues by containing the lightweight fabric dust that easily becomes airborne and causes a huge mess. They were spending about three hours before each shift cleaning these areas before they could begin their actual work. 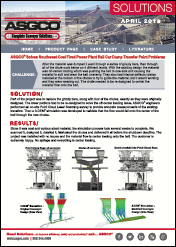 The application was a bit challenging because they did not have large enough chutes to catch the material being cleaned. Challenge: Transfer Clinker into 3 separate locations along the conveyor. 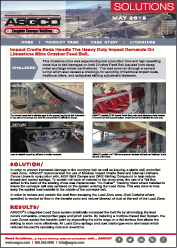 The Customer needed the ability to convey clinker into their bins as needed. This would only be possible using this method or a tripper conveyor. 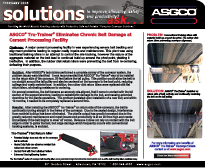 The tripper conveyor would be extremely expensive and would have taken months to design, fabricate, and install. 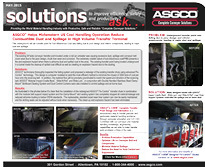 Adding the ASGCO® Lift Bed – Diverter Plows was cost effective and was able to be installed in a matter of weeks. 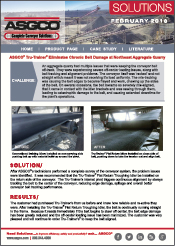 Challenge: This Cement plant’s stacker conveyor was experiencing tremendous belt slippage problems that the conventional rubber lagging that they were using had failed to correct. The harsh wet and cold environmental conditions are tough on belts and are causing the rubber lagging to wear out quickly. 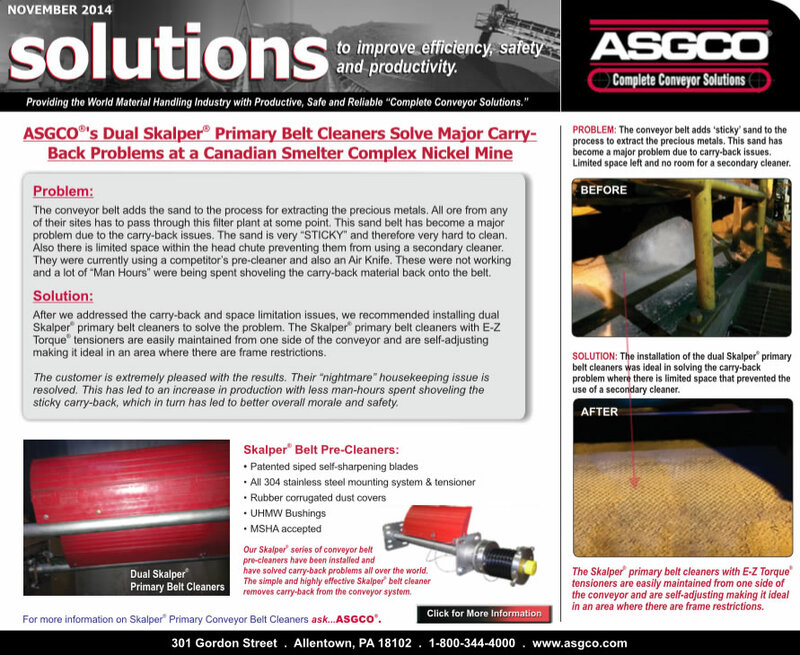 The customer was adamantly opposed to the use of ceramic pulley lagging, feeling it was too tough on conveyor belts. 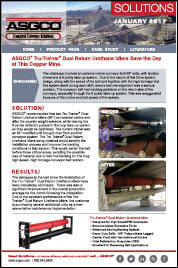 A solution was needed to correct the belt slippage and wear issues while addressing his concerns at the same time. Challenge: The cleaners previously installed on the belt head were bridging, causing the material to cake up between the cleaners, rendering them immobile. 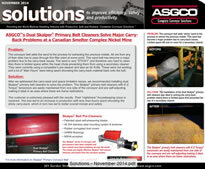 Clean coal fines were sticking to the belt and collecting throughout the conveyor and smoothing over the belt. 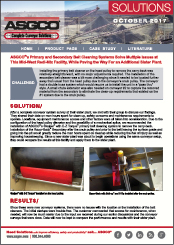 A big part of the challenge was to be able to use the limited amount of space at the discharge chute to install the cleaners and effectively clean the belt, while keeping the chute and the cleaners from bridging, due to the consistency of the material. 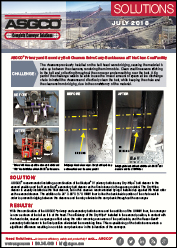 Challenge: This limestone mine was experiencing lost production time and high operating costs due to belt damages on their Crusher Feed Belt (caused from tramp metal and large bolder perforations). The load zone ran through a cement tunnel which also caused a challenge for servicing of traditional impact beds, traditional idlers, and antiquated skirting adjustment fasteners. Challenge: After the material was dumped it went through a series of grizzly bars, then through all of the chute work below on 4 different levels. With the existing design the material was off-center loading which was pushing the belt to one side and causing the material to spill and wear the belt unevenly. They also had internal deflector plates installed at the bottom of the chutes to try to guide the material, but it wasn’t working and they were wearing out. The chute needed to be re-designed to center the material flow onto the belt. Problem: The existing round chutes were hard to align. The chutes had to penetrate two (2) different levels, each with existing openings and be able to line up so the material could flow without interference. The incredibly heavy, thick and pasty material made it nearly impossible to convey and to flow through the chutes, causing continuous outages and downtime for maintenance. 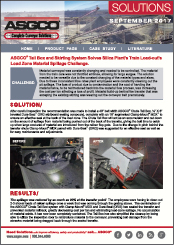 Challenge: An aggregate quarry had multiple issues that were keeping the conveyor belt off-track. They were experiencing severe off-center loading issues, along with belt tracking and alignment problems. The conveyor itself was ‘racked’ and not straight which meant it was not receiving it’s load uniformly. The mis-tracking was causing the belt edges to become frayed and worn, chewing up the sides of the belt. 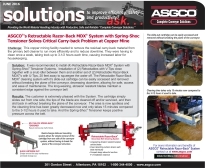 On several occasions, the belt became so severely mis-aligned, that it came in contact with the idler brackets and was sawing through them, leading to catastrophic damage to the belt, and causing extended downtime for the plant’s operations. 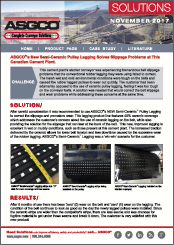 ASGCO®’s New Semi-Ceramic Pulley Lagging Solves Slippage Problems at This Canadian Cement Plant. 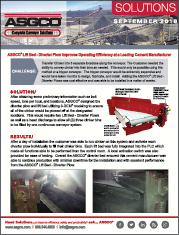 Challenge: This cement plant’s stacker conveyor was experiencing tremendous belt slippage problems that the conventional rubber lagging they were using failed to correct. The harsh wet and cold environmental conditions were tough on the belts and caused the rubber lagged pulleys to wear out quickly. 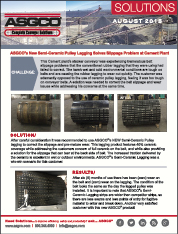 The customer had been adamantly opposed to the use of ceramic pulley lagging, feeling it was too tough on the conveyor belts. 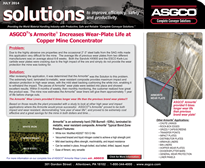 A solution was needed that would correct the belt slippage and wear problems while addressing these concerns at the same time. 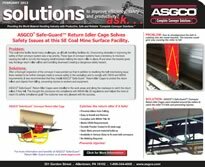 ASGCO®’s Primary and Secondary Belt Cleaning Systems Solve Multiple Issues at This Mid-West Redi-Mix Facility, While Paving the Way For an Additional Sister Plant. Challenge: Installing the primary belt cleaner on the head pulley to remove the carry-back was relatively straightforward, with no major adjustments required. The installation of the secondary belt cleaner was a bit more challenging since it needed to be located further away than usual from the head pulley due to the conveyor’s snub pulley. 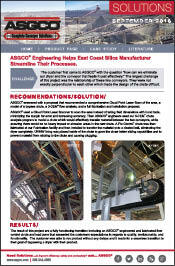 The conveyor had a double truss system which would require us to install the unit in a “pass thru” style. A small chute extension was also needed on conveyor #2 to capture the removed material from the secondary to eliminate the clean-up requirements that existed on the #1 system due to the snub pulley. 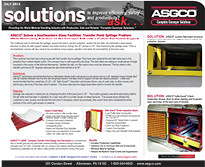 ASGCO® Tail Box and Skirting System Solves Silica Plant’s Train Load-out’s Load Zone Material Spillage Challenge. Challenge: Material conveyed was constantly changing and needed to be controlled. The material from the train cars was not throttled at times, allowing for large surges. 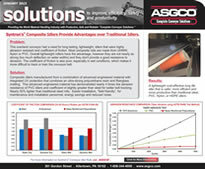 The solution needed to be versatile due to the constant changing of the material types and sizes. Due to these inconsistent flow rates plant employees were constantly cleaning out the pit spillage. 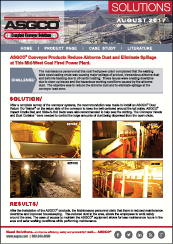 The loss of product due to contamination and the cost of handing the material twice, to be reintroduced back into the material flow process, was increasing the cost per ton affecting a loss of profit. Material build-up behind the transfer that was escaping the existing skirting was wearing out the conveyor belt prematurely. 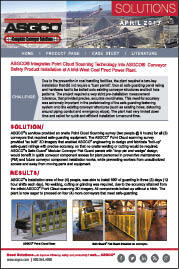 ASGCO® Conveyor Products Reduce Airborne Dust and Eliminate Spillage at This Mid-West Coal Fired Power Plant. 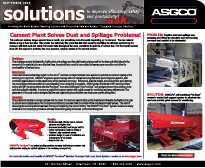 reduce the airborne dust and to eliminate spillage at the conveyor load zone. 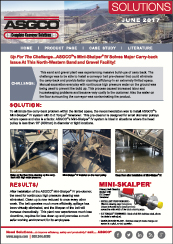 Up For The Challenge…ASGCO®’s Mini-Skalper® IV Solves Major Carry-back Issue At This North-Western Sand and Gravel Facility! Challenge: This sand and gravel plant was experiencing massive build-ups of carry back. the carry-back and provide better cleaning efficiency in an extremely limited space. the conveyor was contaminating the product. a very strict pre-installation measurement tolerance, that provided precise, accurate coordinates. quick and efficient installation turnaround time. 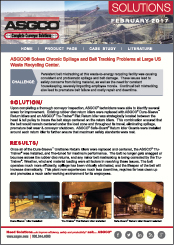 ASGCO® Solves Chronic Spillage and Belt Tracking Problems at Large US Waste Recycling Center. 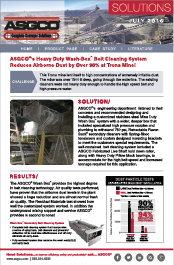 Challenge: Persistent belt mistracking at this waste-to-energy recycling facility was causing consistent and problematic spillage and belt damage. These issues lead to safety concerns from falling material, as well as the need for constant housekeeping, severely impacting employee morale. 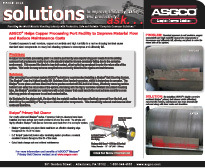 Continual belt mistracking also lead to premature belt failure and costly repair and downtime. because of the incline and belt speed of this system. 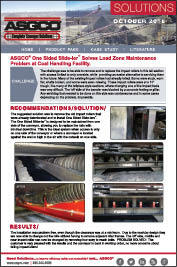 ASGCO® One Sided Slide-ler™ Solves Load Zone Maintenance Problem at Coal Handling Facility. like many of the tailpiece style sections, where changing one of the impact beds was very difficult. 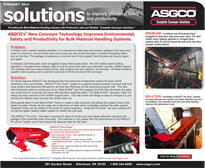 ASGCO® Engineering Helps East Coast Silica Manufacturer Streamline Their Processes. 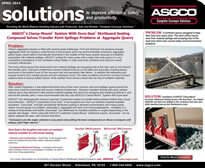 Challenge: The customer first came to ASGCO® with the question “how can we eliminate our dryer and the conveyor that feeds it cost effectively.” The largest challenge of this project was the relationship of these two conveyors. They were not exactly perpendicular to each other which made the design of the chute difficult. 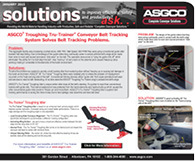 guide roller trackers which continually failed, causing belt damage. 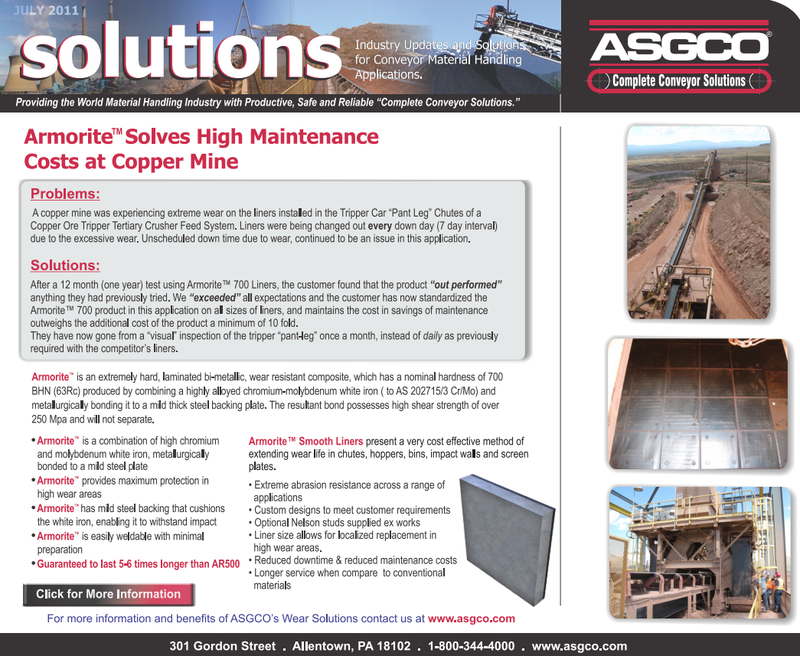 ASGCO®’s Heavy Duty Wash-Box™ Belt Cleaning System Reduces Airborne Dust by Over 90% at Trona Mine! Challenge: This Trona mine lent itself to high concentrations of extremely irritable dust. not heavy duty enough to handle the high speed belt and high pressure water. Challenge: For many years this conveyor had a hydraulic three return Idler belt training system that wouldn’t properly keep the conveyor belt in line. The plant was facing constantly downtime to repair the hydraulic system. 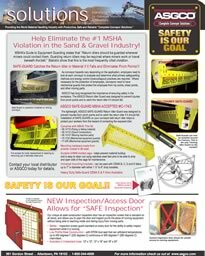 Even when operational, the belt would veer off of center and come into contact with the structural supports, leading to critical damage to the belt and costly material spillage. 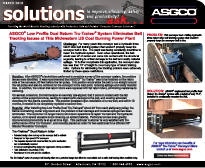 To further complicate this application, the conveyor also has less than 13” of height to mount any type of return training roller. Options for eliminating the tracking problem were extremely limited by these space restrictions. 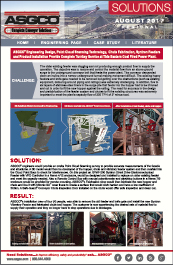 Challenge: A major cement processing facility in was experiencing severe belt tracking and alignment problems leading to regular costly repairs and maintenance. This plant was using traditional training idlers in an attempt to control the mis-tracking, however the nature of the aggregate material on the belt lead to continual build up around the pivot point, yielding it ineffective. In addition, the rubber disk return idlers were preventing the belt from re-centering, defeating their purpose. 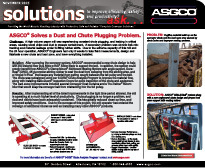 ASGCO® Solves a Dust and Chute Plugging Problem. and make room to change the 20° section to 35°, thus minimizing the spillage issue. and allow for serviceability of the load zone. 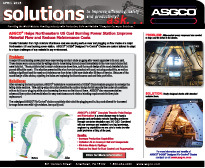 This underground rail car transfer point for Sub-Bituminous Coal was failing due to poor design and inferior components, leading to major dust and spillage. 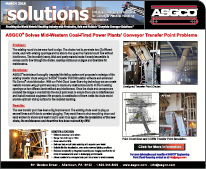 Constant abrasion from high moisture bituminous coal was causing serious wear and plugging on flow chutes at a major Northeastern US coal burning power station. 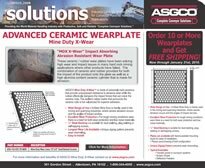 ASGCO® 3-DEM® Designed Flo-Control® Chutes are custom tailored to adapt to unique challenges of any material in any environment. 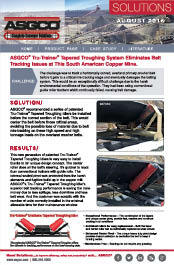 Constant exposure to salt moisture, copper concentrate and high humidity in a marine shipping terminal cause standard steel components on many belt cleaning systems to decompose and ultimately fail. Current recycling disposal laws make it more important than ever to offer comprehensive recycling programs to reduce landfill materials and increase post consumer recycled materials. 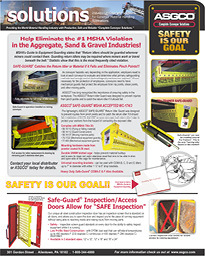 Safe-Guard™ – Return Idler Guard – Prevents Injuries!